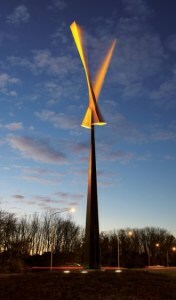 Every work day, I used to drive past this 11-metre wind-driven whirling object in the median of Yarra Glen Drive. Eventually I troubled myself to find out that it’s Dinornis maximus, a long-extinct bird species and a “Kinetic sculpture” by New Zealander Phil Price, a “wind-powered ballet in the sky”. Price says he seeks a “combination of movement that provides a flow and a dance”. It’s large, but motorists can ill afford to glance at it, for it’s close to a busy and potentially dangerous junction. It moves in the slightest breeze, and the curved blades change colour as they move, yellow and orange against blue. But you share this experience only if you take your life in your hands, walk up to it, and spend time looking. Its siting is the source of its problems. It’s impossible to park and walk over to take a look, and by the time it caught my attention, I was already somewhere else.